Extortion is the practice of obtaining something, especially money, through force or threats. However, with the crime committed by the “budol-budol” gang in the Philippines, it’s like extortion with consent. [VIDEO]: Look through these circumstances when one is extorted with money as if hypnotized – and the various cases filed against Budol-budol gangs. 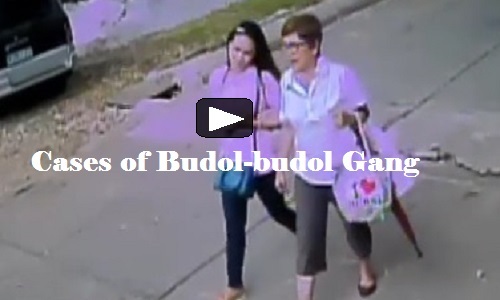 A gang that extorts money and valuable items from their willing victims are called Budol-Budol in the Philippines. It is not sure if they use some kind of hypnotism or just the power of the tongue. Making too good to be true promises and befriending their targets are their main strategies. Senior citizens who have some money or valuables kept for retirement are favorite targets of the budol-budol gangs. They are trustful and easy to convince. Very open to friendship with strangers as well. Therefore, they are prone victims to the crimes committed by the group. How about Senior Citizens Protection? Since Senior Citizens are asked to sacrifice for the society, can there be efforts to protect them from Budol-budol crimes? Families are not always there to monitor them. Can there be a surveillance protocol using technology to track down such activities? Again, another public service effort that must be looked into by people in power. The current lifestyle does not allow quality mingling with the seniors in the family. Work demands, little children supervision, and spousal responsibilities can lessen one’s time to be there for the elderly. Community activities can help. What is extortion in a Caring Community? Social activities are vital for the well-being of senior citizens. They should have their own group or association in their community. It would be hard to entice them with false offers when they have some other people to confide with. What is extortion in a caring community? Busted crime, that’s all! Previous post: How do we go about Crimes not related to Drugs?